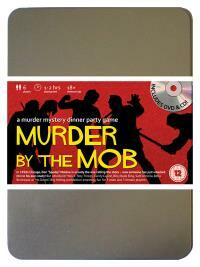 You've been invited to play the role of BILLY BADA BING in Murder by the Mob. Chicago in the late 1920’s is overrun by the mob, most of whom have been invited to "Spudsy" Malone’s party. However, when the Don welcomed everyone to celebrate the invention of his new potato alcohol drink, he wasn’t expecting any of them to "do him a favour" and shoot him in the chest. Join with us to find out who whacked the big potato! "The Kid" – Mob Leader (eat, sleep, shoot, shoot some more!) Costume suggestion : Loose trousers, open necked shirt and braces give you the appearance of always being ready for action (or just leaving the scene of some). You wear a trilby for evening occasions but never let a suit jacket get in your way. You and Spudsy met last year, when he took a much-needed Sabbatical. He immediately welcomed you into his “family”, and before long you became his right-hand-man. Of course, that means now that Spudsy’s dead, you’re in charge so no one better have any ideas! You can’t help it if you’re a better mobster than all of them.